This RV Park offers excellent views of the Matanuska Glacier and even has doll sheep on the surrounding mountains. The park offers full hook ups including showers, WiFi, and laundry. The cafe has great food (especially pizza) and the staff is friendly. This RV Park offers full hook ups with laundry, shower, and full service market on site. The showers were very clean with excellent water pressure ($2.00 for 10 min). Laundry facilities was large and clean. Market staff were extremely friendly and knowledgeable about area. They were kind enough to lend us bear spray for our Russian River hike. Lending library also available in market place to exchange for a new book. The Princess Lodge itself is large with 2 restaurants and a large deck that looks out onto the Kenai. They offer shuttle service to and from the lodge and RV Park as needed. The lodge also has a beautiful trail with decks looking into the Kenai the shuttle can take you to and from as needed. The market staff were really amazing and we enjoyed our stay here very much. We tried one of the restaurants in the Lodge and unfortunately weren’t too impressed. We will definitely stay at this RV site again in the future. Can’t beat the location and hospitality! This campground in Denali State Park opened in 2017 contains both a tent and RV loop, as well as, cabins. Vault toilets, drinking water, firewood, fire pits, and picnic tables available. RV sites include electric hook-ups. Several hiking trails in close proximity to campground. Amplitheater for ranger led programs also available. Williwaw Campground near Portage Glacier is a must stay for those visiting Chugach National Forest. Located central to several hiking trails, salmon viewing, and 1.5mi from the visitor center. This campground offers large sites for RVs and tents alike. Picnic tables and fantastic fire pits at every site. Vault toilets and potable water available, as well as, electric hook ups for RVs. We are looking forward to staying here again soon! Tucked back in the woods next to Tolsona Creek this campground is about 15 miles from Glennallen. This campground has a small shop, laundry, showers, flush toilets, dump stations, and offers electrical hook ups for RVs. All campsites appear to be located along the creek. This is a family owned campground that offers daily family friendly activities. Teklanika Campground is a phenomenal location for camping in Denali. 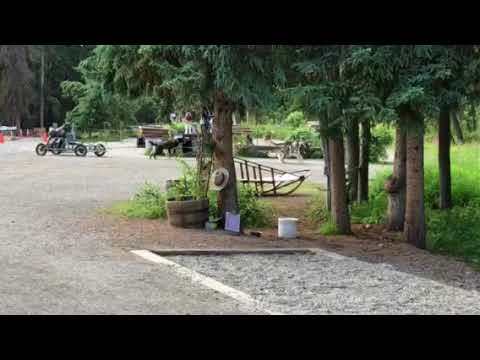 Accessible to both tent and RV campers at mile 29.1 on the Denali Park Rd this campground has vault toilets, picnic tables, and fire pits and requires a minimum 3 night stay with no access to the front of the park (without additional fees) once you arrive. Campers here purchase a Tek Pass which allows access further into the park via the bus system (the only way to get further into Denali from this campground). Our favorite feature of this campground was the Tek River which is directly next to the campground. The river bar made for excellent hiking and adventures for the whole family with plenty of animals to see. We would definitely camp here again! We LOVED Blue Bell and Custer State Park! The campgrounds were very clean and quiet. Camp hosts were very knowledgeable and available if needed. Evening programs offered every night were educational and entertaining for the most part. We stayed in a tent site which had a wonderful tent box that accommodated our 17'x8' tent rather well. Metal picnic table and fire pit were well maintained with ample room on this large site. Showers, flush toilets, potable water, and garbage area are centrally located on the grounds (a bit of a walk from the tent sites but made for a much quieter stay). Loved the location close to the wild life loop! Wild turkey, rabbit, and deer roam the grounds regularly. No mosquitos, wolves, or bear in this area (we did hear coyote regularly) which was a very pleasant surprise. We loved it here and can't wait to visit again! We stayed in the Grant Campground for a 10 days and found it to be a wonderful family campground. Sites were large (however close together) with picnic tables and fire pits with grills at every site. Potabable water, bathroom, and dish washing facilities within walking distance of sites. We appreciated that it was far enough from the crowded area of Old Faithful and Canyon but still made it easy to visit the entire park. We were also close to Grand Teton and mde a few trips down to explore. Shower facilities were clean and had hot water - no time limit and 2 showers included per night with site reservation. If you are camping with an RV this does NOT have hookups but does have a dump station. During our 10 day stay there was only 1 bear sighting in the campground and it was the first in 4 weeks (this campground appears to have less bear that Canyon and Tower Falls). Overall a wonderful campground. We will stay here again on our next trip. This campground was away from the primary campground like Jumbo Rock and therefore less crowded. Campsites included fire ring and picnic table. Flush toilets on premises and away from primary sites. Tent sites were very close together and as we found or a very popular site for star gazing and meteror showers. Required aunt of a drive to get into the primary park area and firewood not available in campgrounds (Walmart is the closest location it was available). Camp hosts were very nice however did not enforce quiet hours. We camp with our daughter (5 at the time) and unfortunately we were surrounded by many college students drinking heavily (not Joshua Trees fault). We ended up leaving a day early because of this. Aside from the other campers we had a good desert camping experience. I think next time we would try a different site to attempt to be more secluded and avoid this issue in the future. This was a fantastic campground for a family. Hikes within short walking distance and within bike or short car ride to general store and lodge. Coin showers and bathrooms were very clean. There is a laundry site (this was open) and second general store on premesis however it was not open for the season yet. Camp hosts were very nice and knowledgeable about area. Wood bundles were delivered directly to site. Tent site came with picnic table and large fire pit with grate. This made for an amazing first experience at Big Sur. Highly recommend.